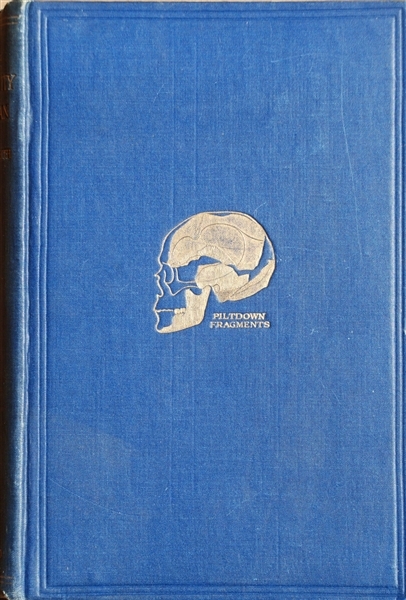 Darrow’s signed copy of Sir Arthur Keith’s story of the Piltdown Skull - cited by scientists at the Scopes Monkey Trial as proof of evolution, the skull was revealed to be a hoax in 1953. Book Signed “Clarence Darrow” in dark pencil on the front free-endpaper. “The Antiquity of Man” by Sir Arthur Keith. Volume II. Chapters 20-36, 5.75” x 8.5”, pp. 377-753. Philadelphia: J.B. Lippincott Company, 1925. Second Edition, Sixth Impression. Illustrated. Blue boards. 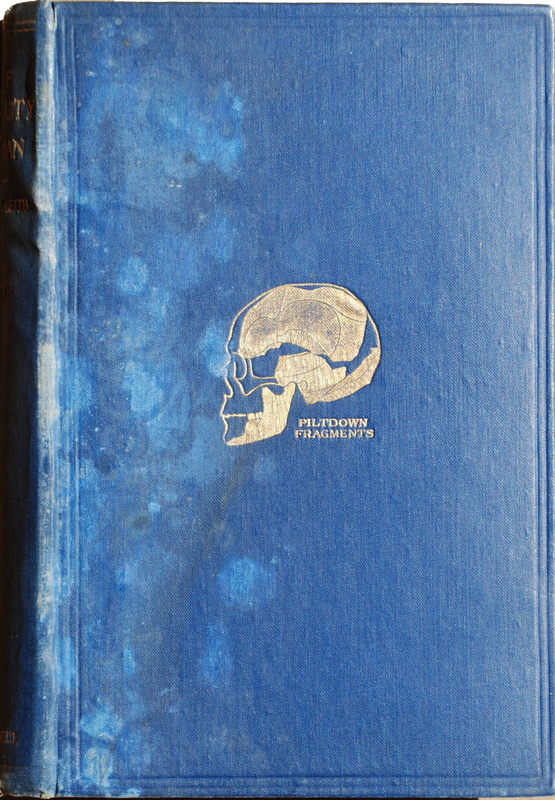 Skull titled “Piltdown Fragments” each printed in gilt on cover, gilt lettering on spine. Front cover and joint heavily water stained. 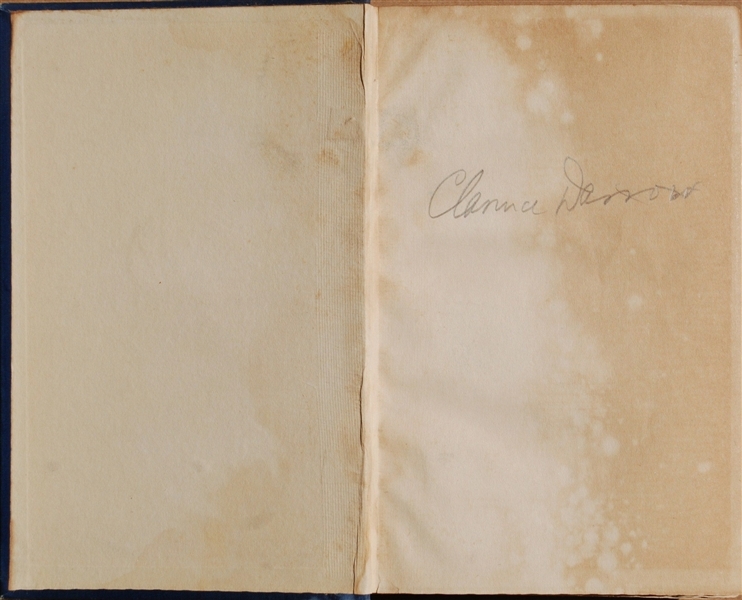 Toned, rippling, and foxing on front free-endpaper not materially affecting Darrow’s bold signature. Some pages uncut. Includes two-volume index. 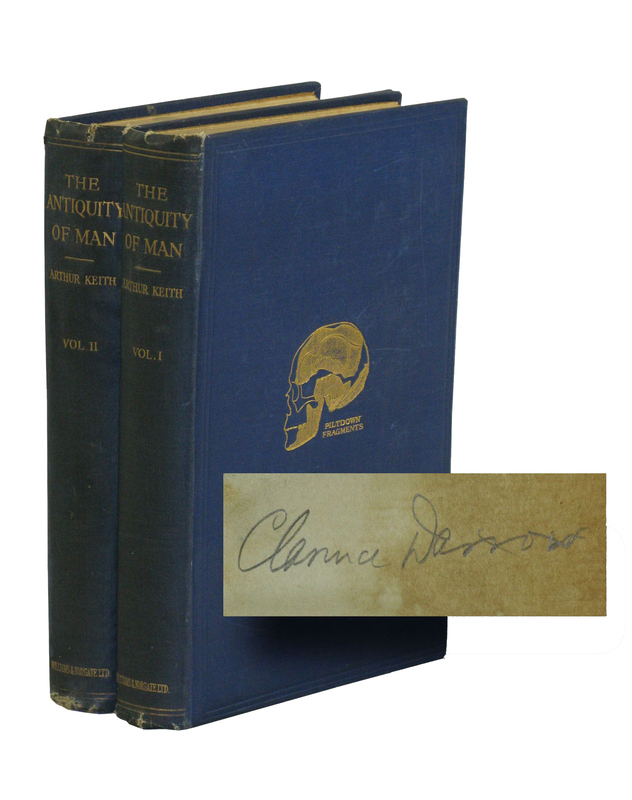 Also present, not owned by Darrow, is Volume I, “The Antiquity of Man” by Sir Arthur Keith. Signed on the front free-endpaper in ink “Arthur Keith / Royal College of Surgeons / London Sept 30th 1927.” Philadelphia: J.B. Lippincott Company, 1925. Second Edition, Sixth Impression. Illustrated. Blue boards. Skull titled “Piltdown Fragments” each printed in gilt on cover, gilt lettering on spine.